üstorage capacity of the pumping well as well as skin effect and storage capacity of the observation well could be taken into account (see corresponding complimentary solutions below). Confined aquifer of lateral infinite extent (cross section). 1) Moench’s solution for drawdown in the fully penetrating observation well in confined aquifer; the solution takes into account storage capacity of the pumping well, storage capacity of the observation well and skin effect of the pumping well. Moench A.F. Flow to a well of finite diameter in a homogeneous, anisotropic water table aquifer // Water Resources Research. 1997. Vol. 33, N 6. P. 1397–1407. 2) Moench’s solution for drawdown in the pumping well in confined aquifer; the solution takes into account the storage capacity and the skin effect of the pumping well. 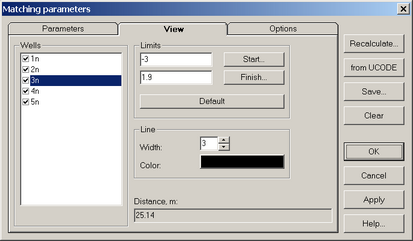 Graphical methods are displayed only for the basic solution. 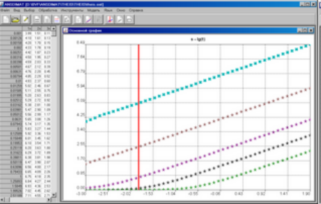 Parameters matching /matching the observed data against theoretical curves/ can also be made using complementary solutions. Then the following additional parameters should be specified such as: casing radius of the pumping well, skin hydraulic conductivity, skin thickness and, if needed, shape factor of the observation well. Cooper H.H., Jacob C.E. A generalized graphical method for evaluating formation constants and summarizing well-field history // Transactions, American Geophysical Union. 1946. Vol. 27, N 4. P. 526–534. Hantush M.S. Analysis of data from pumping tests in anisotropic aquifers // Journal of Geophysical Research. 1966a. Vol. 71, N 2. P. 421–426. Hantush M.S., Thomas R.G. 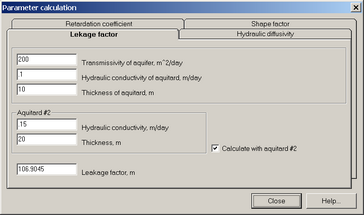 A method for analyzing a drawdown test in anisotropic aquifers // Water Resources Research. 1966. Vol. 2, N 2. P. 281–285. Jacob C.E. Effective radius of drawdown test to determine artesian well // Proceedings of the American Society of Civil Engineers. 1946. Vol. 72, N 5. P. 629–646. Papadopulos I.S., Cooper H.H. Drawdown in a well of large diameter // Water Resources Research. 1967. Vol. 3, N 1. P. 241–244. Theis C.V. The relation between the lowering of the piezometric surface and the rate and duration of discharge of a well using ground-water storage // Transactions, American Geophysical Union. 1935. Vol. 35, pt. 2. P. 519–524.